What is Foil Scrim Kraft (FSK) Insulation? Foil Scrim Kraft or FSK insulation is a flame retardant, vapor-barrier, and is one of the most commonly used facings in the insulation industry today. A FSK insulation facing is made of lightweight aluminum foil that is layered against a fiberglass scrim and then paired with a final layer of natural brown kraft paper. This is then all laminated together using a flame-retardant adhesive. 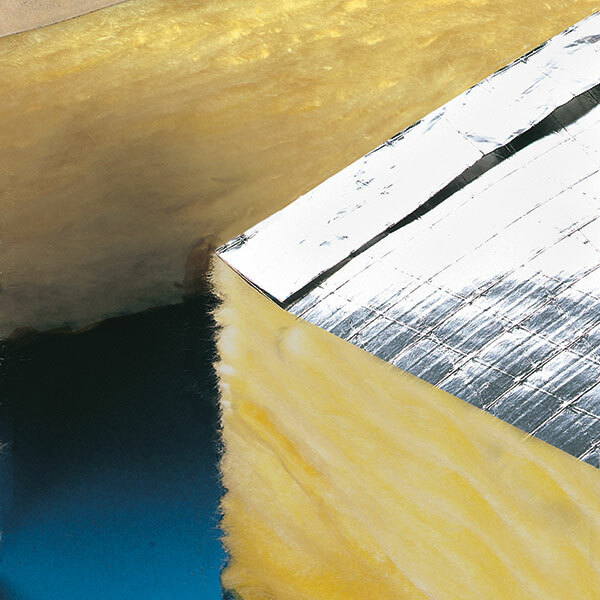 FSK insulation is most commonly utilized with duct wrap, duct board, and mechanical spin-glass boards on the outward-facing, exposed surfaces of HVAC ductwork, but is also used in batts for exterior walls, and ceilings. We installed R19 FSK batts insulation on all four exterior walls covering all of the exposed wood surfaces with foil material. We also installed R38 Fiberglass batts insulation in the ceiling that were covered with FSK paper, and taped the seams with an FSK tape totaling just shy of 8,000 square feet of material. No matter where you live, one of the most common problems home owners face are clogged gutters. The offending culprits range from twigs, leaves, pine needles, shingle grit, even firework debris (if you like to enjoy an exciting holiday or have close neighbors that do), all of which can wreak havoc for the gutters on your home over time. Let’s take a look at reasons why – and how – gutters get clogged. When searching for the perfect abode, many of us seek a serene setting with scenic natural surroundings and enjoy the beauty and shade trees can provide for our homes and our landscapes. There is no doubt that living among the trees can add to the enjoyment of a home, however, their seasonal shedding is also a great recipe for clogged gutters. One of the main causes of gutter clogging is the proximity of your home to trees. Let’s face it, trees shed. Some leaves find their way onto roofs and from there, into the gutters and downspouts. Depending on the pitch of your roof, this problem can intensify. Gutters which are not sufficiently angled toward the downspouts can quickly clog. Gutters become impacted with leaves and twigs which remain wet for longer periods of time. Thus creating the perfect storm for problems such as molds, pests, birds, and insects such as mosquitos to make themselves at home. If not treated properly, gutters can begin to sag and overflow, seeping water into your home and damaging the roofing structure or worse, the building’s foundation. Winter is long past us now, but the ice and snow from last season may very well have done some gutter clogging damage to your home. Wintertime clogs produced from icy build up may force additional snow to overflow the gutter, causing damage to the eaves, walls and the foundation. The weight of snow and ice may also warp the gutter away from the roof, allowing seepage of snow or drips of water onto the fascia boards, the interior walls and ceilings. And now that the warmer temperatures have arrived...rotting and warped fascia and structures may be an issue. Don’t chance it when it comes to your home. Contact Arkansas Insulation today for a free estimate. Our team of experienced installers can get the job On Time, Done Right, and Left Clean™. We use Spectra products and accessories to give your home that distinctive, finished look. We also carry the TruGuard Rainware System which is the premiere product on the market for gutter protection. Protect your investment and never clean another gutter with TruGuard! Weather's picking up, is your home ready? In the context of a new home build it can seem like one of those last minute details. However, in the context of a new home build it can be one of the most important. We’ve seen many situational examples when poorly installed gutters and even no gutters at all can cause some very serious damage to your home over a very short period of time. You’ve heard the saying “When it rains it pours”, and it only takes a few storms to wash away top soil, create erosion problems and even cause serious damage to a structure’s foundation. Unfortunately, this can also happen if your gutters get clogged. Northwest Arkansas is by far one of the most beautiful places to live in the United States, and for those fortunate property owners who possess a forest in their front or back yards, this can make gutter cleaning a nightmare. Leave this to the experts, Arkansas Insulation. We can give you a free estimate on gutter and guard systems and show you the best possible way enhance your property’s ability to deal with the torrential downpours this Spring. Preserve the integrity of your investment!